StarCom Racing (SCR) and Superior Essex join forces to raise awareness for Napoleon, TWP Police Department (NTPD) of Michigan. The officers work with a very limited budget and often rely on donations from local organizations to help pay for basic supplies. Currently, the men and women of NTPD need upgraded body and in-car cameras to better protect themselves and the citizens of Napoleon. 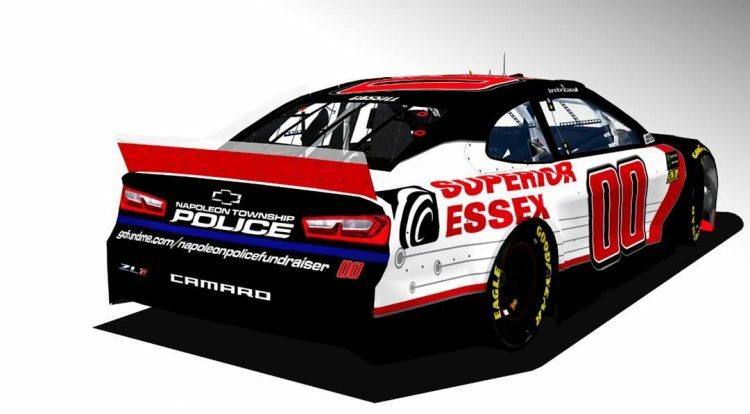 SCR alongside Superior Essex and NTPD Police Chief, Duaine Pittman, have turned to the people of America and NASCAR Fans alike to bring awareness to the department and help them raise funds. NTPD created a Go Fund Me page that can be found at: www.gofundme.com/napoleonpolicefundraiser. We encourage you to head to this site and donate to the police department. All donations are appreciated, and no amount is too small. The goal is to raise $15,000 which will be awarded in full to NTPD at the Firekeepers Casino 400 on Sunday, June 9 at Michigan International Speedway. The race will feature the 00 Chevy Camaro, driven by Landon Cassill. Superior Essex has donated a portion of their sponsorship to honor the NTPD by displaying the department’s badge proudly on the car. “The combined efforts of StarCom and Superior Essex provide a unique opportunity to connect fans of NASCAR and concerned American citizens in supporting a community’s public safety,” said Brian Ensign, vice president, demand creation at Superior Essex.